Rudy is convinced that her teacher hates her because her drawing is at the bottom of the bulletin board and she got assigned the violin instead of the cymbals. While a quick parent-teacher conference clears up the confusion, her longing for metallic percussion remains. 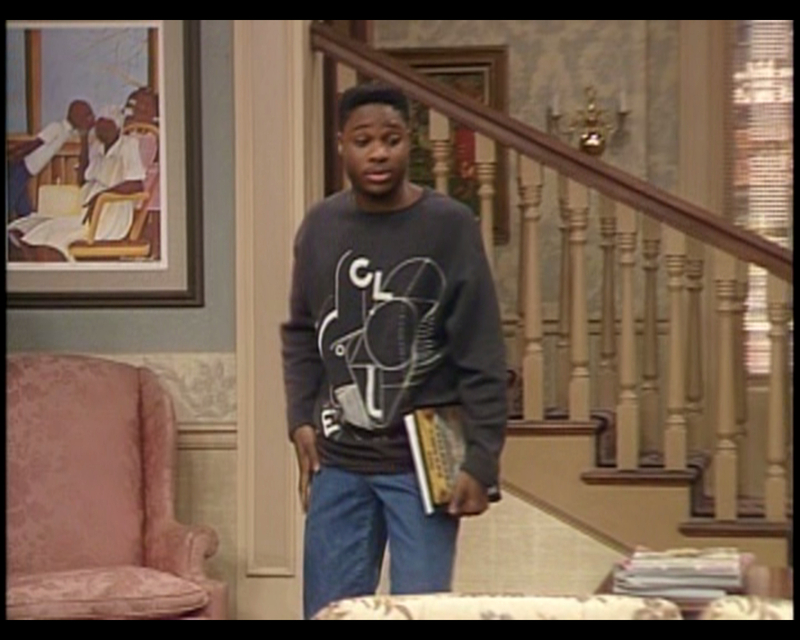 Meanwhile, Theo strives to develop his psychic powers so that he can avoid doing schoolwork. This plan is, as you can imagine, unconvincing to Clair. Since we're working with a three-day story arc with guest stars, we'll have to move pretty quickly to prevent this from becoming a novella. Kim is back with some serious queen bee swag going on. She has the cymbals, she's going to keep them, and Rudy can deal. 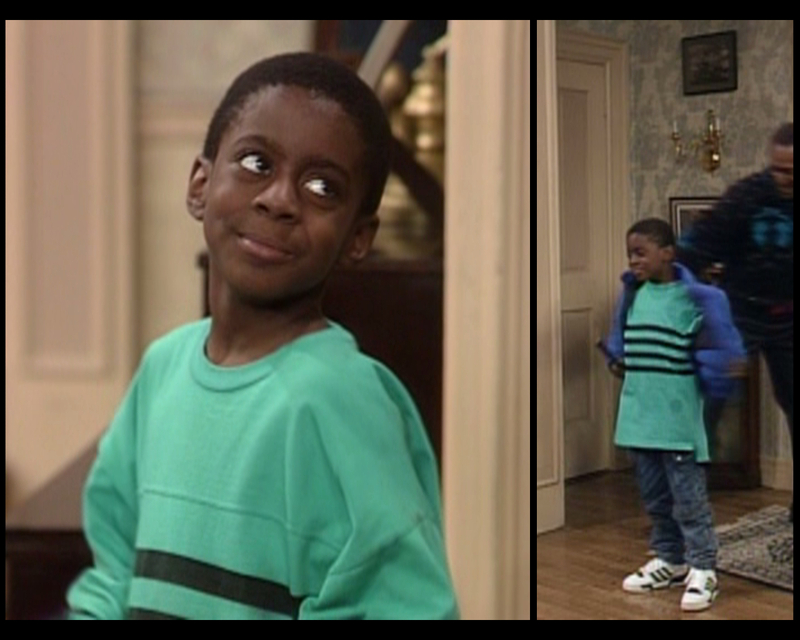 Oh, you're inviting me over for rehearsal? 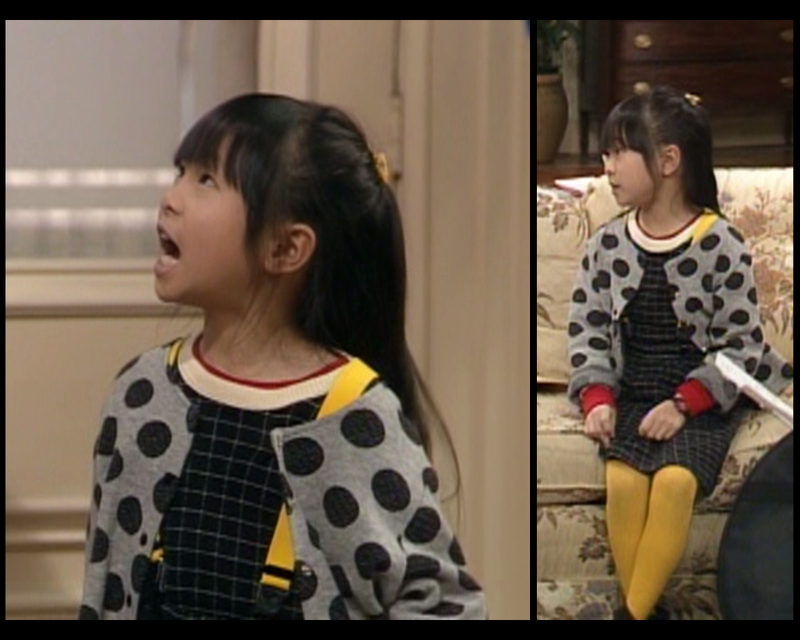 Allow me to wear my best-ever outfit, serving multiple patterns, tights in a primary color, and matching suspenders that might not even be attached to anything. She's throwing around cardigans and hair clips and giant polka dots like it ain't no thang, but rest assured, she knows the impact she has. This is some Regina George action. When Kim grows up, she's going to ruin your life hard, and she's going to look cute as hell while she does it. No one cares how the men on this show dress anymore, huh? Kenny's back, too, looking real in teal. But his back flap reaches practically down to his knees. Remember when it was a thing to wear a dress with jeans underneath? Did somebody order a legend? 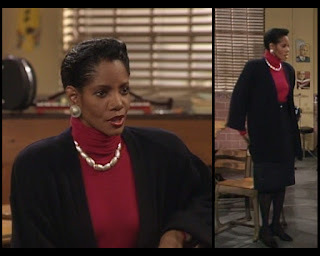 The real get in the guest star category, however, is Melba Moore as Mrs. Abbott, the teacher who categorically does not hate Rudy. Ms. Moore is a Tony-winning sensation. 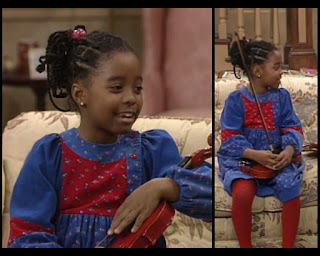 Go look up her performances on YouTube; you won't be disappointed. It also bears mentioning that she was honest-to-Jesus 43 when this episode filmed. She and Phylicia Rashad must be part of a coven. I didn't look this good when I was in my 20s, let alone now. Anyhow, she's every bit the grade school teacher here: black stockings, below-the-knee skirt, long cardigan, long-sleeved turtleneck. The dark, conservative colors and high level of coverage show her commitment to workplace-appropriate attire. At the same time, she has some chunky jewelry and a stellar short hairdo to let you know that when she's not imparting life lessons to her students, she has serious fashion sense. Applause all around. Rudy is working the blues this week, making cool tones the centerpiece of all of her outfits. 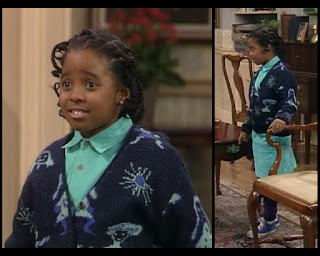 She starts off her in her episode #3.1 cardigan complemented with her #4.3 skirt and a matching shirt. 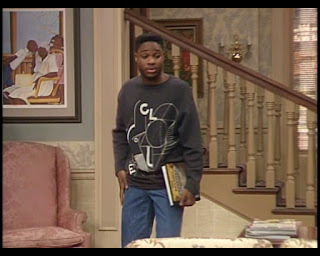 Tights and sneakers in the same color family finish the outfit out. Wearing multiple takes on a single hue is something you can only get away with prior to middle school. Or unless you're completely genius with it. Good thing she's young. It's not easy being blue, either. Back in action with the blue! This time she mixes it up with green stripes and some yellow shoes, not to mention that whisper of red in the collar. I would have lost one of the accent shades myself, and I'm concerned about the three different patterns of striping on her top. Oh and the orange bow. Calm down. Edit. I think I've had nightmares about a creepy doll in this dress. Her final outfit is true blue mixed with true red. To add interest to a decidedly bland palette, she inserts some inconsistent patterning and an asymmetrical design across the chest. I hate this look. Hate it. Please never stop wearing things this fabulous. 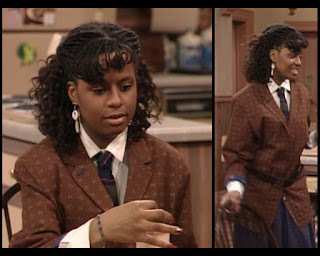 Vanessa starts the episode with a Denise-worthy foray into the art of gender performance. Her Oxford shirt and striped tie pair impeccably with the blazer that has a little bit of a Louis Vuitton thing happening. By rolling the sleeves, slinging the belt low, and wearing a fuller skirt, she makes this into a fashion moment and not just men's business wear. I'm thrilled to see her shine like this. Also: dangly earrings. Her favorite. Her episode #3.14 cardigan is never going to be my favorite, but she at least places it in a thoroughly plausible context this week. The perfectly matched skirt is both disquieting and appropriate, while the striped shirt adds a collegiate flair to the ensemble. Then the mallard brooch comes in and is all, "just kidding!" She may have invented the hipster ethos with this outfit. 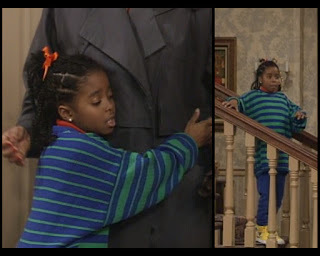 She appears only briefly on day three, wearing a sea green thick-wale corduroy jacket that is too sad to examine in detail. That scarf ain't great, either. His powers of mentalism couldn't fix this somehow? Theo's first sweater has some of his father's influence. It's more busy than bizarre, I suppose, but there's nonetheless a feel that he's reaching for something more than just carefully knotted yarn here. It looks awfully dreary to me: too many heavy shades as opposed to sparks of brightness. I'd encourage him to think more creatively about his palette. This is a repeat from episode #4.2, though I don't think I talked about it last time, either. This is so much better than much of the dreck he's been sporting. I hate to continue grading Theo on a curve, but I also hate to continue crapping on his parade, so there you go. There's a real Boyz II Men vibe going on here, where he's all dapper in his plaid shirt and khakis and cardigan but has left them roomier to add a casual component. The chartreuse and cerulean also change it up and keep him from looking like a brochure for an Ivy League school. 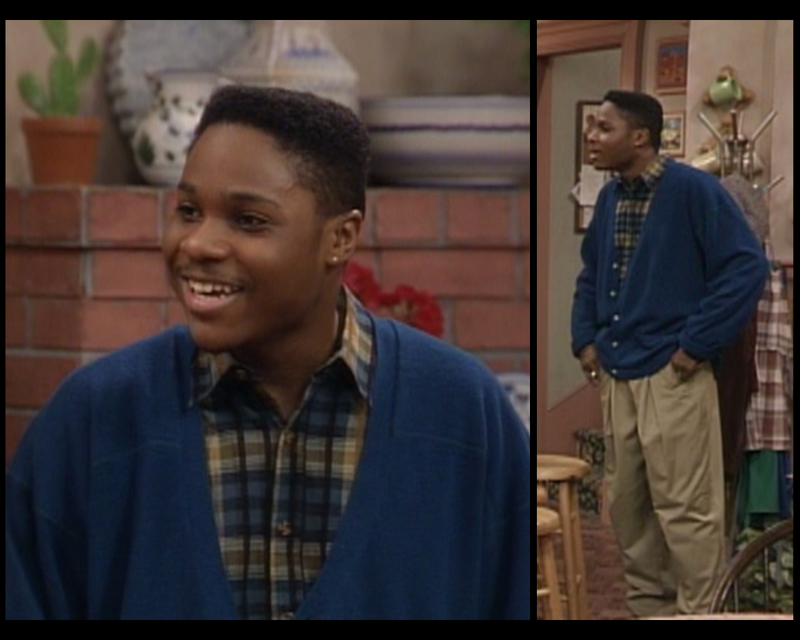 He's basically channeling the early '90s ideal of a perfect boyfriend (before the early '90s, even). He's smart but sensitive. He's preppy but casual. He smiles like your childhood best friend but he wears an earring like a badass. If the kids on 90210 had made one black friend, he would have looked like this. To complement Rudy's commitment to blue this week, Clair is serving a collection of reds. Her first gift to us is the perfect mock turtleneck scarlet day dress. Those voluminous 3/4-length sleeves are perfectly offset by the carefully tailored waist and only slightly flared skirt. Choosing a single statement piece with that impressive golden amulet (which I hope is suspended by fine thread rather than pinned, but whatever) was a daring but effective option. The overall simplicity allows her to get away with the eye-catching colors and oversized adornments that would otherwise seem glaring. If you walked into a room wearing this, you'd get all kinds of noticed. Day two draws her a little closer to the professional side of things; she's going to a parent/teacher conference, after all. Other than the utter perfection of that salmon tone, though, I'm not thrilled with this one. 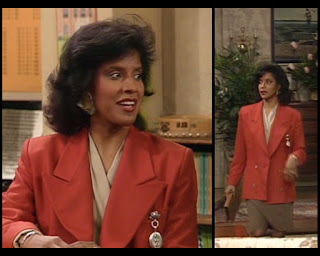 The jacket is so wide that the peak of her lapel is probably closer to her physical shoulder than the actual shoulder seam. Everything underneath is just drab. That's not a creative pleat in her skirt, by the way, just a fold from the way she's walking. And the accessories are strange and mismatched. The silver pocketwatch/medal of honor at her chest is kooky, and the giant earrings are... well, I don't even know what they are, other than out of place. It was a nice try, I guess. And back to flawlessness. The wrap blouse and thick belt give her body-ody-ody, the slightly shorter skirt adds a flirtatious element, and the combination of red and black almost always communicates a certain sexiness. She classes it up with the gold accents; that brooch is right on the border between arty and awful and I love that she went there. I'm surprised more of Theo's friends don't come over to talk to his mom. He's developed a pretty good not-having-it face. Why do we not see more lavender on Cliff? He looks great. 100% great. 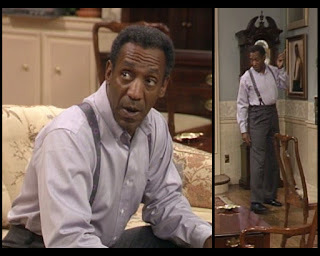 The suspenders are also killer. My one critique is that he's riding his pants awfully high. Men have to make that choice of going over the paunch or under the paunch with their waistband, and each has its drawbacks, but in this case he's clearly pushed it too far. His fly zips practically up to his sternum. I wish every sweater could be a legit Cosby Sweater. Another art sweater! 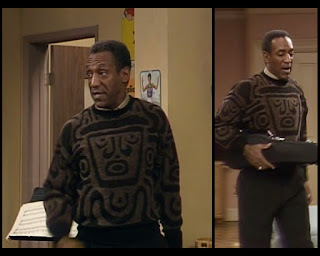 It wasn't until I saw the thumbnail of this screencap that I even caught the stylized face in this garment: I thought it was just a weird, abstract print. It's sort of eerie that what I thought was a bland outfit is actually looking at me. 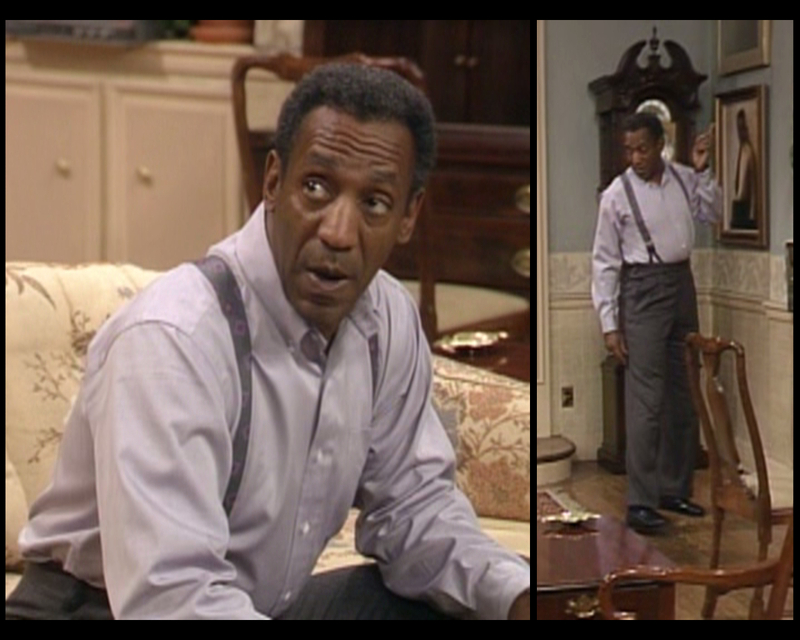 Tricky, Dr. Huxtable. Very tricky. It's not great. I'm not opposed to the idea of stepping on it. When I first captured that full-length image, I was sad that it was blurry. 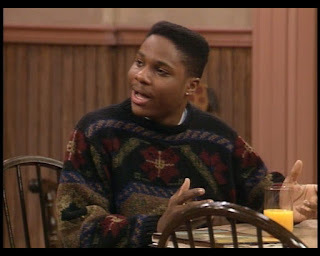 Then I realized that no, it's the sweater itself that's blurry. Taking my advice to Theo about bright colors to heart, Cliff spices up this black fluffy number with some neon footprints. It's a well-intentioned idea that unfortunately doesn't quit gel in my estimation. The foot is a bizarre choice for a design element, but at the same time I also think there are too few feet to really sell that selection. 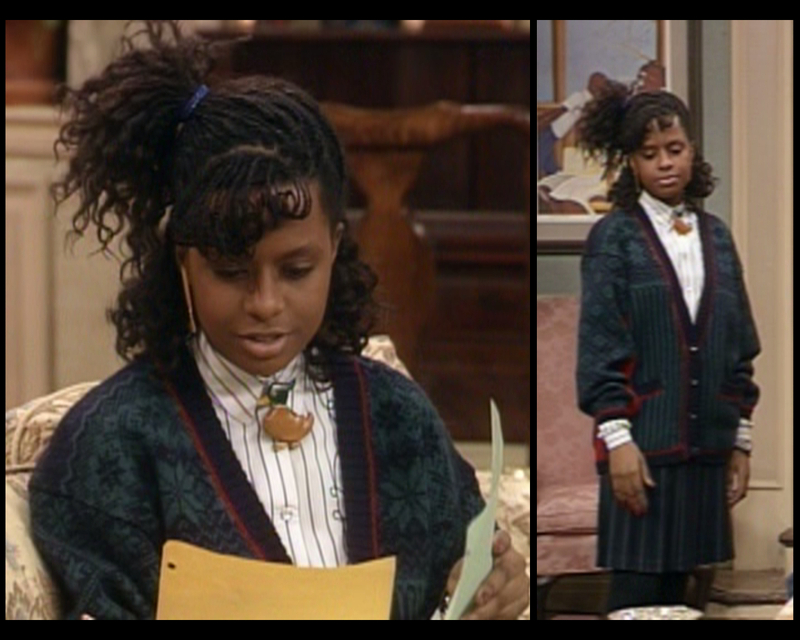 If anyone knows the virtue of going all the way with a nutty fashion concept, it's Cliff Huxtable. This was the wrong time to show restraint. Well, that's done. makes you long for the days when everything happened over a couple hours, huh? 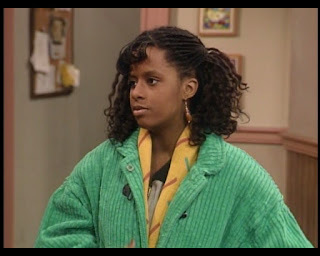 Also, let's keep our fingers crossed for more Denise soon. This blog just isn't the same without her. OK, see you next week, all. Great commentary as always; Clair and the asian kid had some killer outfits. 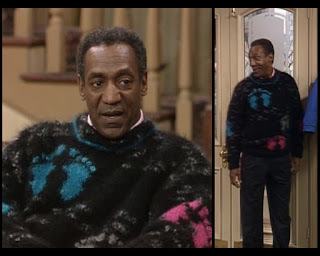 I'd like to point out that the pink and blue footprints on Dr. Huxtable's sweater are none-too-subtle call out to his profession. The sweater print is like one of those old timey photos touched up with color, only this old timey B&W photo was a sonogram, touched up with some clip-art. I was just going to point that out, about the baby-doctor sweater. You make my Mondays worth getting out of bed.